You can drop off household hazardous waste in Norwalk today, Saturday, Aug. 25, but only until 2 p.m.
Norwalk’s event, open to residents from Darien and other area towns, started at 8 a.m. at Norwalk High School: 23 Calvin Murphy Dr. (County St.), Norwalk. The next household hazardous waste dropoff day is Sept. 15 in New Canaan (see list of locations and days below). The collection event takes place rain or shine and costs nothing. You should bring a driver’s license or vehicle registration with you to prove you’re from Darien. This event is for dropping off hazardous material from households only — no material from abusiness will be accepted. If you have more than 40 pounds or 30 gallons to drop off, or for other questions regarding the household hazardous waste collection, you can call Norwalk city government’s Customer Service line at 203-854-3200. Garage: Gasoline, auto care products, oil-based paints or alkyd paints, stains, thinners, spray paints, etc. Garden: Insect killer weed killer, fungicides (rose dust), chemical fertilizers, garden lime, etc. Household: Cleaners, polishes, mercury thermometers, pet care products, pool chemicals, etc. Area household hazardous waste collection days. Darien residents can go to any of them. On Saturday, May 5, from 8 a.m. to 1 p.m., the Town of Greenwich is holding the annual Household Hazardous Waste Day for both Greenwich residents and participating towns with proof of residency. 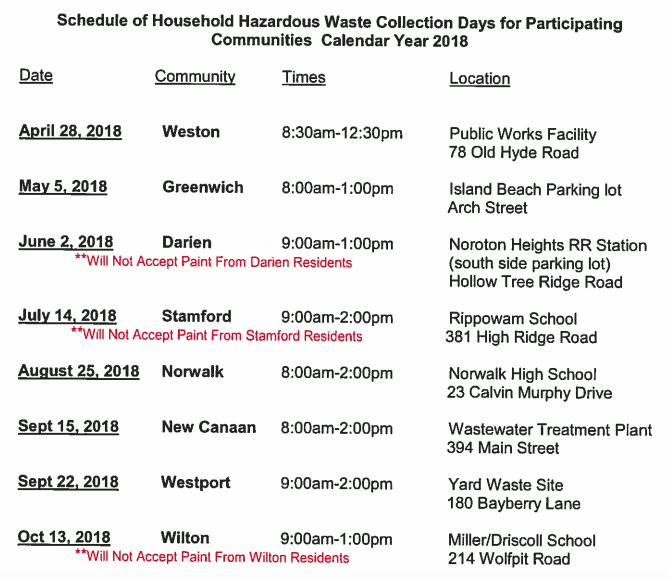 If for any reason you don't want to wait another month to get rid of your household hazardous waste in Darien, then drive to Greenwich on Saturday.